Solitaire Till Dawn offers over 100 different solitaire card games, from familiar favorites to obscure delights waiting for you to discover! 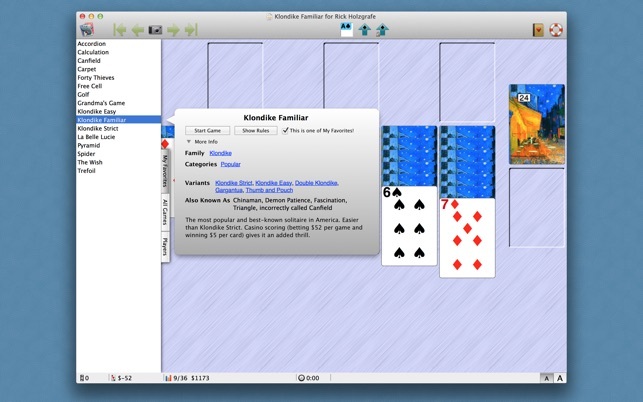 Play Klondike, Pyramid, Free Cell, TriPeaks, and more. 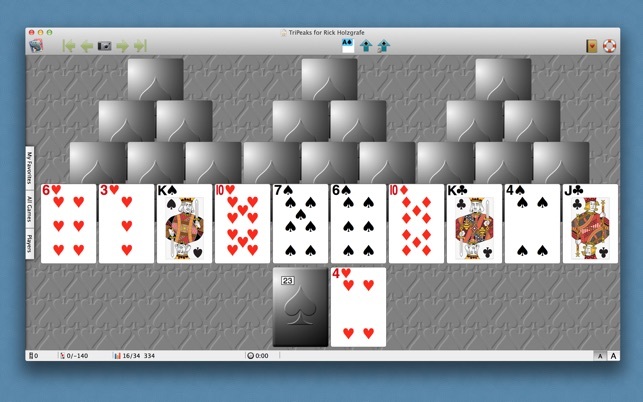 • Over 100 different solitaire games! 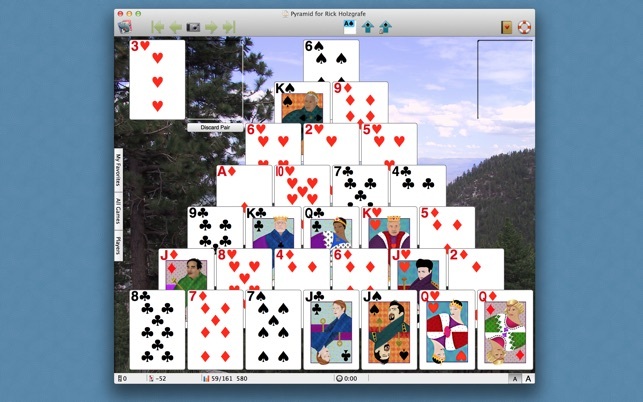 First released in 1991, Solitaire Till Dawn has been developed and improved for over 25 years. 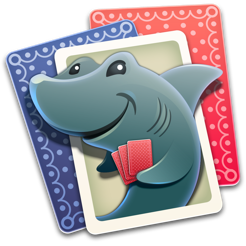 Macworld magazine said of an earlier version: "Solitaire Till Dawn is the best solitaire game I've seen on any platform", and MacAddict magazine awarded its highest rating, "Freakin' Awesome!" This new version was written from the ground up for modern Macs, and we think it's even better than ever. Visit our Web site at http:www.semicolon.com for more info! I love this game and have spent/wasted countless hours enjoying myself … so why 2 stars? Because if I didn’t love this game, I’d give it a Negative 3 stars! It quits on me randomly, with no explanation. It has done so twice within the last 20 minutes. So I will switch to an app that I don’t like as well, but is more stable, and just sit wishin’ and hopin’ that Solitaire til Dawn would get its act together and fix the situation. I have stuck with these guys for years, and this began cropping up (and I have reported to Apple EVERY TIME) about a year ago. Kept thinking that with every update, it would get better. No such luck. I’m so sorry to have to say that UNTIL they fix it, don’t waste your time! Oh, I’m having so much fun! 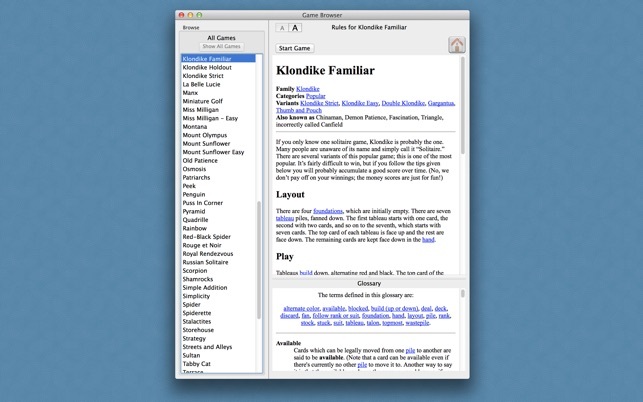 I used to play this in its previous incarnation, and am delighted it’s back for OS X. I am reveling in the games list, seeking out old friends and exploring games whose names simply appeal to my curiosity. 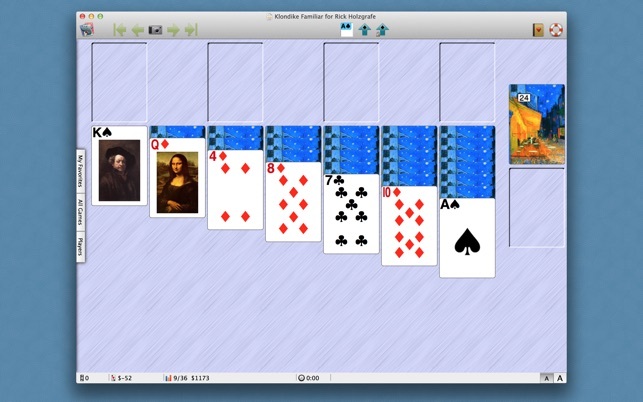 This is an elegant, attractive implementation of solitaire games for everyone and any mood. Here, in one place, are games that are easy, difficult, quick or brain-burners, single-deck, double-deck, math-based, memory-based, have variants or are related to others, are well-known or unusual, offer me simple luck-of-the-draw, or I’d-better-develop-some-skills-if-I-want-to-win-this. I can find whatever suits my fancy at the time (mathy ones usually don’t, but there are so many other choices). There are clear descriptions, rules, tips for playing, analyses, and finding-aids for games. Play is precise and easy, with undos, snapshots, scoring and statistics, personalized lists and game-saving. My favorites list is filling fast as I explore further. You’ll not be disappointed; I’m not! Long ago, when I was a student, I had a paperback book titled something like "The Complete Book Solitaire Games"; it had over 200 different solitaire and solitaire-like card games. Being a poor student, and decks of cards being cheap, I soon had a number of favorites with which to kill time when papers refused to write themselves. Solitaire Till Dawn has ALL of them! It's like the programmer took that old book and brought it to computer life, and I love it! The new iteration is excellent; the graphics are smooth and the cards are easy to read. If you like solitaire games, give this app a shot--once you dive into the rabbit hole, you won't want to come out! Copyright © 2013-2017 by Semicolon LLC. All international rights reserved.